The DCPDL09 series of DC DC converters offers up to 90 watts of output power in a compact and low profile package. 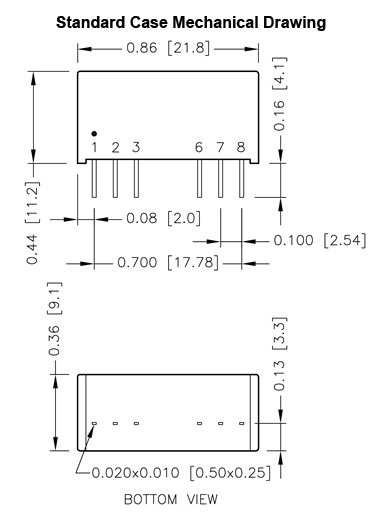 This series consists of both single and dual output models with 2:1 wide input ranges. Models in this series have a high efficiency up to 89%, low standby power, and over load and short circuit protection. Models are also compliant to both RoHS and REACH and have UL60950-1, EN60950-1, IEC60905-1, UL62368-1, EN62368-1, & IEC62368-1 safety approvals. Dimensions: Standard Case: 0.86" x 0.44" x 0.36"
Metal Case: 0.86" x 0.44" x 0.38"
Notes: (1) “x” in model name indicates the case type. 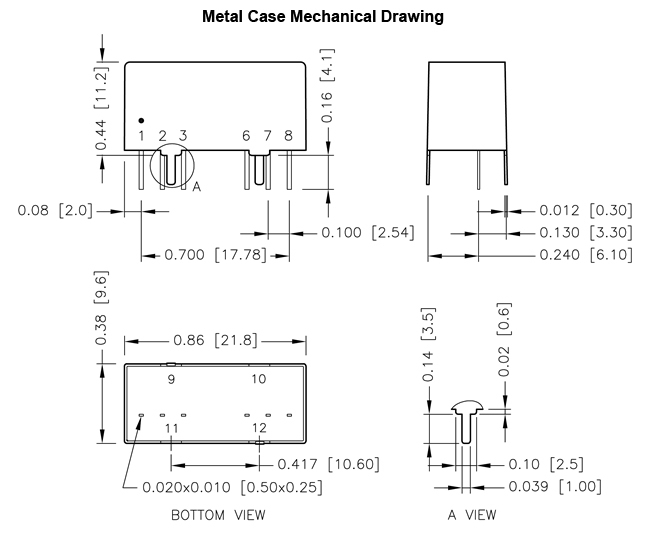 “x” can be “S” to indicate standard (plastic) case or “M” to indicate metal case. (2) The standard modules either EMI Class A or Class B with external components. For further information, please contact factory. DCPDL09-12xxx & DCPDL09-24xxx recommend to use an aluminum electrolytic capacitor (Nippon chemi-con KY series, 220µF/100V) and a TVS (SMDJ70A, 70V, 3000Watt peak pulse power) to connect in parallel. DCPDL09-48xxx recommended to use an aluminum electrolytic capacitor (Nippon chemi-con KY series, 220µF/100V) and a TVS (SMDJ120A, 120V, 3000Watt peak pulse power) to connect in parallel.